We all knew that Motorola was cooking something up for XOOM users of their Feedback Network but we did not know it was going to be this big. 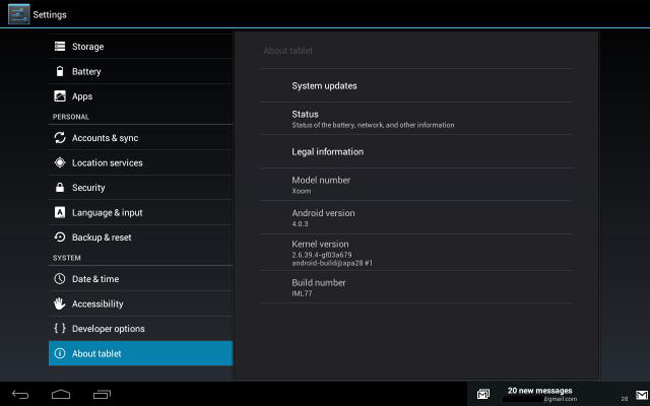 The “project” that Motorola had in mind for the members of their network is an update to Android 4.0.3 Ice Cream Sandwich. The update has already started rolling out to members of the group last night and the community has been all over it. It is good to see a “Google Experience Device” getting the update finally and depending on how well this rollout goes, Moto could be looking to push this out to a wider swath of XOOM users fairly soon. Solnarz, one of the main minds behind Tiamat which is one of the best known XOOM ROMs, released a .zip soon after news broke that this update was out in the wild. The .zip contains the official OTA in it’s entirety but there is a catch; you must be stock and non-rooted to flash it. This means if you are rooted running a ROM, you will need to downgrade to Honeycomb HTK75D before applying this update.zip. Keep in mind as well, this update is meant for US WiFi XOOMs, anything other than that is risking it. If you are already stock and un-rooted on Honeycomb than this should be an easy install for you; just drop it onto your SDcard and then install via recovery. Any XOOM users going to have a crack at this? Many users have been reporting that flashing the update with a thumb drive and a connected USB cable works best. Links to how to do it through that way can be found HERE. My apologies on this one, it has been so long since I dealt with the stock XOOM recovery I forgot that it had no update.zip flashing capability so here is a quick walkthrough on how to install Clockwork Recovery to your device to allow you to update to Ice Cream Sandwich. This requires no root and should have no bearing on the installation of today’s update.zip. 1. Download the recovery file image HERE. 2. Move the image file over to wherever your adb and fastboot files are set up in your computer. 3. Connect your XOOM via USB cable. 6. Now that you have your Clockwork Recovery installed just drop the ICS update.zip onto your SDcard, boot into recovery and select the “update.zip” function. Your XOOM should take care of the rest! Friday Poll: Most Memorable Moment From CES 2012?